Hello there! I hope everyone is having a lovely Wednesday night. I am 4 days away from my preliminary exams and I am writing a blogpost so that's a clear indication on how i'm going. I have so much work to do but I have no idea where to begin so i'm basically fighting an endless battle of procrastination. So here's a quick nail of the day! I named this nail look as Night Confetti because the rainbow glitter creates a party-life effect on the nails and with the black base colour, this is definitely a party at night! When I first came across this spectacular glitter combination nail polish, I knew I had to get it. I have previously seen Deborah Lippmann Nail Polish in Happy Birthday (buy here), Models Own Nail Polish in Hed Kandi (buy here), American Apparel Glitter Nail Polish in Supernova (buy here) and OPI Nail polish in Rainbow Connection (buy here) and they have all NAILED IT in the nail polish department (get it? nailed it? no? okay.). I came across the Australis Nail Polish one day after school and since it had a deal at 2 for $10, I decided to try it out. I love the glitters and how they vary in colours and size. The polish was easy to apply and it took the standard amount of time to dry. One major disappointment of the nail polish is the quality of the clear base coat. When I wanted to reapply the nail polish, it had turned gloopy and lumpy, the texture of nail polishes that have been lying around for a year. Sad thing was I only got the brand new bottle for a day and the consistency was already appalling. I am quite fond of this nail polish combo and I will probably experiment with different base colours. Spring is coming in 2 days so I may be applying some pastels and brights soon! Hopefully the glitter nail polish would last until Spring and if it doesn't, I may need to invest in the American Apparel one. LOVE YOU! Thanks for reading! P.S. It has been a month since I first created this blog. All is very exciting if you ask me! The blogging community is extremely exciting and I just love every aspect of it. Expect plenty more posts in the future :-). cute cute nails! i'm obsessed with glitter! That's so cute, I want to try out a glitter nail polish! I really like gilter nail polishes to and this one is just beautiful! 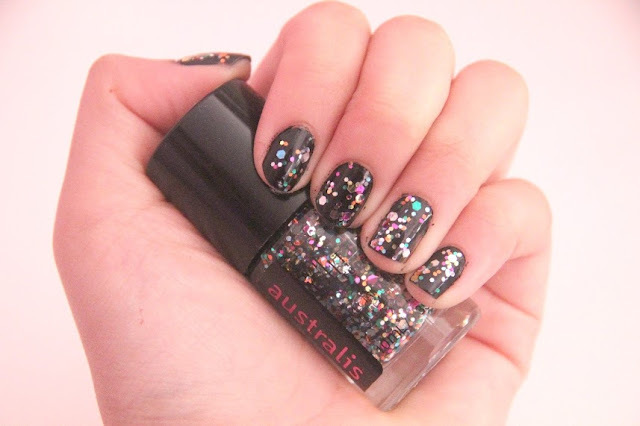 Such gorgeous nails, love the fun glitter look on them - great for a night out on the town!! LOVE all the glitter! It's amaze! I've just done a DIY nail tip on my blog so be sure to check it out and let me know what you think of it! These nail polish shades are gorgeous! Great review. I'm surprised I didn't stumble across your blog earlier! That top coat is amazing!! So cute and fun!! Great post. nice, glitter nail polishes are always fun and great for party! wow love these nail polishes!!! The only glitter I like is on my nails! I really love this! :) It looks fantasticccc. wouldn't mind me some of that confetti, it would work perfectly for that one statement glitter nail look!